Here is another of my Finish-Along projects well underway. I think it is called the Cabbages and Strawberries quilt due to the colours and what matches out in the garden currently. I have an enormous cabbage waiting to feed a small country. 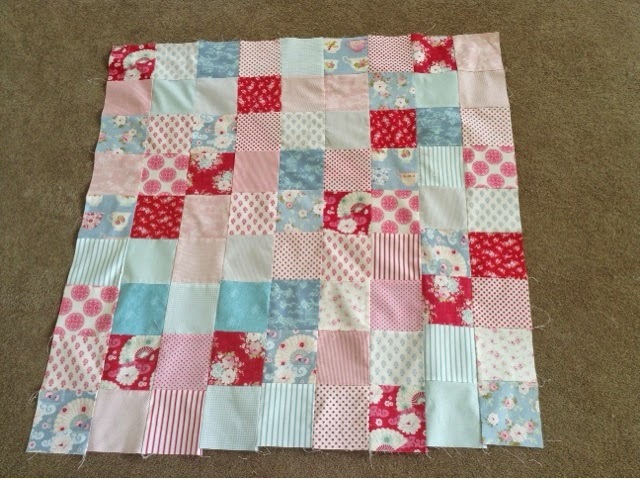 This is all Tilda and is two charm packs just pieced in strips then the rows are joined. See - very lazy. especially as the corners don't join perfectly. Those Tilda charm packs are (from previous experience) not cut quite square. Do I worry about stuff like that? No. If you are one of life's perfect people youcan carefully square up each square. Then super carefully match everything as you sew, and feel utterly horrid over a tiny misalignment. Perfectionism is not healthy - my wise words of the day.